Chinese Vice Premier Han Zheng on Wednesday stressed the use of clean energy for winter heating in the country's northern region. 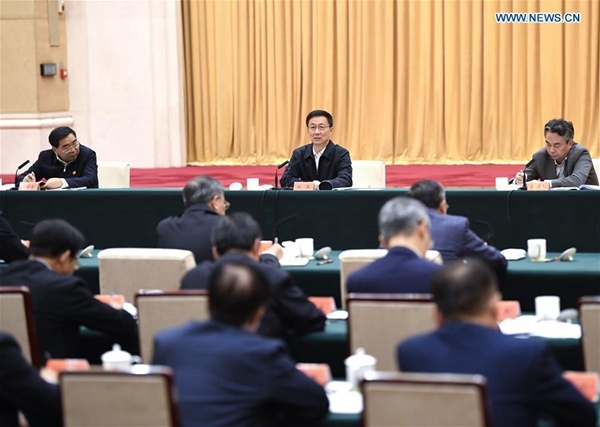 Han, also a member of the Standing Committee of the Political Bureau of the Communist Party of China Central Committee, made the remarks at a symposium held during his research trip to Shijiazhuang, capital of north China's Hebei province. China should ensure that people in north China will be kept warm and safe in winter while at the same time making progress in improving air quality, Han said. Authorities must make sure of the source of natural gas before taking down old heating facilities, Han said, adding that efforts should be made to increase the natural gas supply. By the end of October 2018, a total of 3.62 million additional households in Beijing, Tianjin and 26 other cities in nearby regions will have had their coal-fired heating systems converted, according to an official plan released earlier this year.